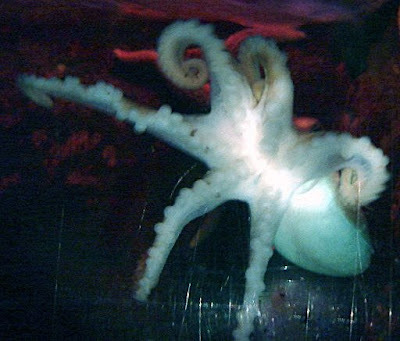 It would of course be technically nonsensical to describe this creature as a "six-legged octopus". "Octopus" meaning "eight-legged", it would be similar to talking about a "three-wheeled bicycle". What this picture depicts, therefore, is a hexapus. Henry the Hexapus - as he has been christened by his keepers - is a resident of Blackpool Sea Life Centre in the north-west of England. His shortage of extremities is the result of a genetic defect, rather than an accident, and he is believed to be the first of his six-legged kind known to humanity. no. pentagons have 5 sides, true, but hexagons have 6. the numbering terms for babies are completely different than the numbering terms for shapes. hence, they're called quintuplets when there are 5 of them, and not "pentuplets".